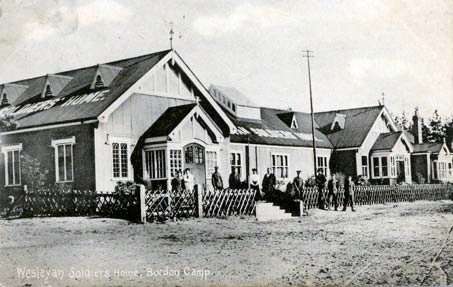 The Wesleyan Soldiers Home was opened in 1905, 300 yards behind the C. of E. Institute, overlooking a valley of heather and pines. The cost of the building was 2,500 Pounds and it was of wood covered by a roof of corrugated tin and painted dark green. A garden surrounded the Home, which was laid out with flower beds and seats all along the front. It was declared open by the Rt. Hon. Earl of Donoughmore, who said that now Bordon and Boredom were not synonymous terms! There was a games room, a billiard room, a reading and writing room, in which daily papers were provided, a devotional room and a lecture hall seating 300. There were 10 bedrooms together with 3 baths and a suite of rooms for the chaplain. It was closed and demolished in 1960.